Modern mobile devices such as LG G6 have become an important partner of almost everyone. These devices have made communications fast and convenient and contacting relatives, friends, acquaintances, clients, and business partners has been done in just a few clicks. 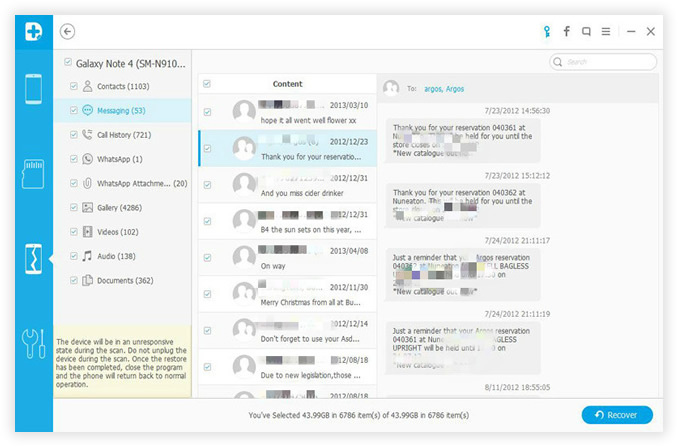 Users can store the names of the people they need to reach in the phone's contact list so that their numbers and names will never be forgotten. Compared to writing the numbers in a memo pad, having a contact list is much easier because data are organized. You can click the name and hit a button to make a call. There is no need to turn pages and scan the list, which usually take so much time and effort. The same is true when it comes to text messages. A text message will reach the recipient the moment it is sent and it can be stored for future reference. Message that contain important details such as tracking numbers, bank account numbers, or credit or debit card numbers, and other business transactions are too important to lose. However, there are unavoidable incidents that may result to losing all these important data. You may accidentally drop your device onto a hard surface, get it wet, or it might be corrupted due to computer virus. If any of this happens, you will surely lose important data in your LG G5 or G6 phone.. In the past, lost data are gone forever but nowadays, you need not fear about this issue because we have brought you a solution – Android Recovery. It has earned the reputation as the world's number one, you can easily and quickly recover data that you have lost. Even if your device cannot be opened anymore, this software has the capability to dig deeper into the system of your device to recover whatever data you have lost, including your contacts and messages in your LG Optimus phone. Doing this is very simple. All you need to do is to click some buttons and you can recover them and create back up so that you can transfer them to a new android once you have bought a replacement to your damaged device, it allows selective recovery so that you only restore whatever files you want to keep. Supported LG Devices: LG G6/G5/K10/V10/G4/G3/G2 , LG G Flex 2/Flex and others. Directly run the program after downloading and installing it on your computer, and connect your LG phone to the computer with USB cable, here we take Samsung S5 as an example to explain how it works. It will present you the window as follows. To let the program get access to your phone, you should enable USB debugging on your LG device by following the routine below. After you enable USB debugging on your LG phone, then click the "Start" button to analyze and scan the lost SMS, contacts on your LG phone. It will take some times to finish the whole analyzing process based on the data size on your phone. Note: An application - Superuser Request will pop up on your device's screen, you need to click 'OK' in order to this allow the program Superuser authorization to scan your phone. When the scan is over, all recoverable messages, contacts and other data on your LG phone will be found and displayed in the scan result. You're allowed to directly preview all the recoverable files one by one and then you can select out those you want quickly. Just click the contacts, messages items you need and export them to your computer by clicking "Recover". A pop-up window will ask you to set a path to save the data. With this program, users of Androids such as LG Optimus, G2 and G3 will be assured that they can keep their data and use them whenever needed even if their mobile device stops working. Maintain contact with your loved ones, relatives, friends, business associates, and customers for enhanced personal relationships and more profitable business deals even if your android has been damaged or corrupted. Get this app from Androidphonesoft at the most affordable price. Enjoy money-back guarantee if ever you feel not satisfied with the way the program performs. This informative article not only helps you understand why the lost data still can be recovered, but also help you figure out how to transfer text from Android to computer, You even do not need know anything technical but just follow the above steps. Then you can get your trouble solved!